During the Ottoman era, in the 18th Century, there was the great Serb Migration, when the Serb population in Kosovo headed north, leaving Kosovo relatively de-populated. This allowed the Albanians to move in and claim the area. With the withdrawal of the Ottomans, Kosovo was then taken over by the Serbs, who tried to dislodge the Albanians from the region with a re-colonisation plan to bring the Serbs back. This policy was met with partial success, and the region was under Serbian control up to WWII. Under Italian control, the map of the Balkans was re-drawn, with Albanian lands in Kosovo, Macedonia, and parts of Montenegro, being placed with Albania, to create a "Greater Albania." Once the war finished, Kosovo returned to Serbian control, and became part of the Serbian part of Yugoslavia. There she remained until 1989, when Milosevic began his push for a Greater Serbia. Pushing for a Greater Serbia led to a concerted campaign against ethnic Albanians who moved to peaceful resistance against this. With a punitive Serbian controlled regime in place, the slide to war began, and finally in 1998 there was, effectively, full scale war. The KLA had some notable successes, and the Serbs hit back with strong reprisals, such as mass killings, and forcing thousands from their homes. Finally, in 1999, NATO began a bombing campaign, which finally drew the Serbs to the negotiation table after a long and sustained campaign of bombing. Milosevic agreed with a NATO led peace force taking over in Kosovo, whilst it remained part of Serbia. 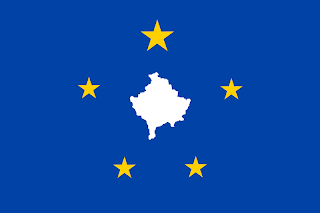 Kosovo's future was subject to 8 years of debate, until, in 2008, Kosovo formally declared its independence. This independence has not been without controversy, though. As of today, only 65 nations have acknowledged Kosovo's independence.Most of the EU has, but not Romania, Greece, or Spain. Saudi Arabia, Jordan, and Afghanistan in the Middle East, Japan and Taiwan, Australia, New Zealand, and many Pacific nations, Colombia and Peru in South America, The US and Canada, several Caribbean nations, and a few in west Africa. 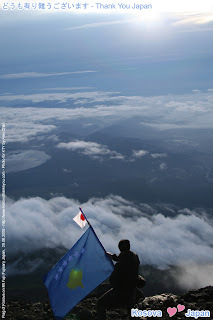 An international competition was organised to create a flag for Kosovo. 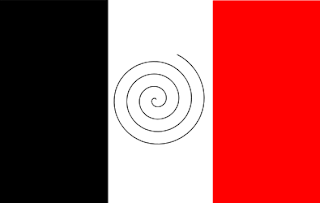 Two notable choices included 1 as a black, white, and red tricolour, with a Dardanian spiral sun in the centre. 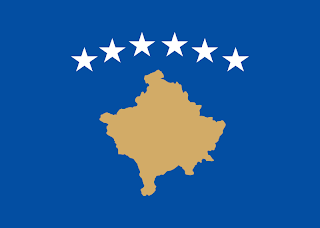 Another option was a blue flag, with a map of Kosovo in the centre, with 5 gold stars round it. The Kosovan assembly opted for a modified version of the second choice. A blue flag, with the map switched to gold. The stars where moved to form an arc over the map, turned from gold to white, and had a sixth star added. There is no official definition of the colours used, but the use of blue and gold has been inspired by the EU flag. The stars themselves officially represent the 6 ethnic communities that make up Kosovo. Albanians, Serbians, Turks, Gorani, Roma, and Bosniaks. Unofficially, however, the stars are said to represent the six nations with Albanian populations. Leading to great debate about a future push to create a Greater Albania once more!